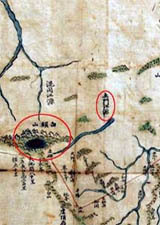 Gando (間島) part of Manchuria north of Yallu (鴨綠) and Tumen (豆滿) rivers belonged to Korean territory. This map shows that Tomun River(土門江) in center red circle, is different from Tumen River (豆滿江) in red circle in right hand side. China has maintained that Tomun River(土門江) is the same as Tumen River (豆滿江).